The dogs at the Dog Gallery. Unfortunately, this museum doesn't exist, but you can enjoy the fantasy of it in this 1000 piece puzzle. 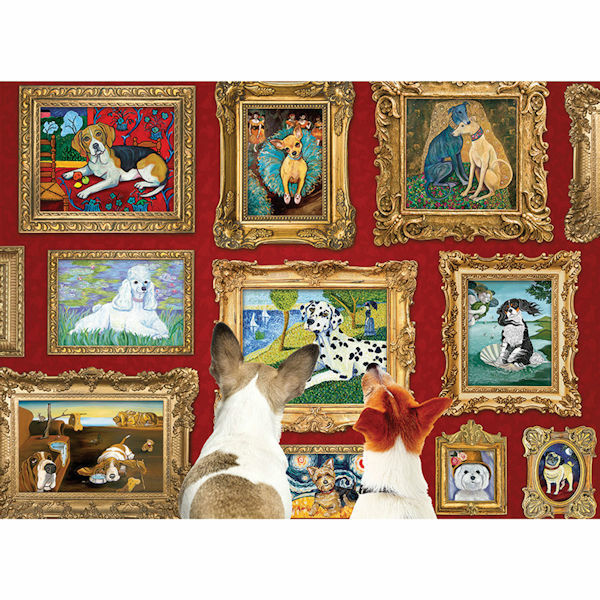 It'll be an affordable way to have a version of "Starry Night" and Klimt's "The Kiss" in your collection - if you don't mind the interpretation with dogs. Original artist Gretchen Serrano. Made in the USA with the finest inks, premium grade blue board, and linen wrap. Measures 26.625 by 19.25 inches when complete.